May is National Egg month. Why the month of May was selected considering that the highest egg purchased is in April, right before Easter, is any ones guess. But this little package of protein has a higher level of healthy fuel compared to any energy drink that is filled with mostly sugar and caffeine. Eggs are one of those foods that shares a function as well as a debate. Can one even imagine lemon merguine pie without the Merguine? Custards, omelets, pies and even some breads have relied on this shelled wonder. So why do we have such a love-hate relationship with this oval delight? To answer that, we must first understand the making of an egg. Chickens are one of those creatures that have but one role in life, to lay eggs. With the exception of laying fertlized eggs to hatch a few baby chicks, most hens are content to roam the field and scratch the ground looking for grasses, grains, worms, bugs and small pebbles. 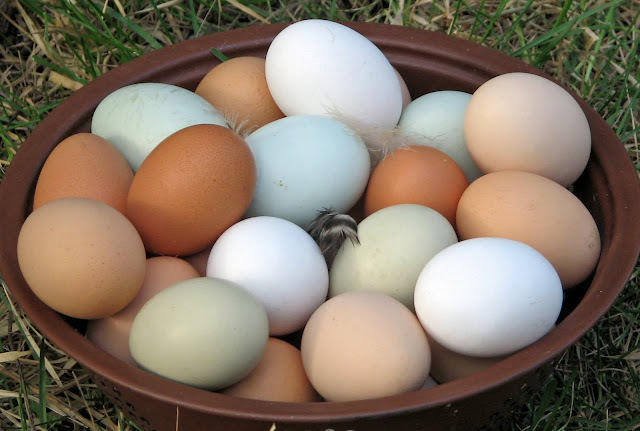 Chickens produce egg cells just like humans. 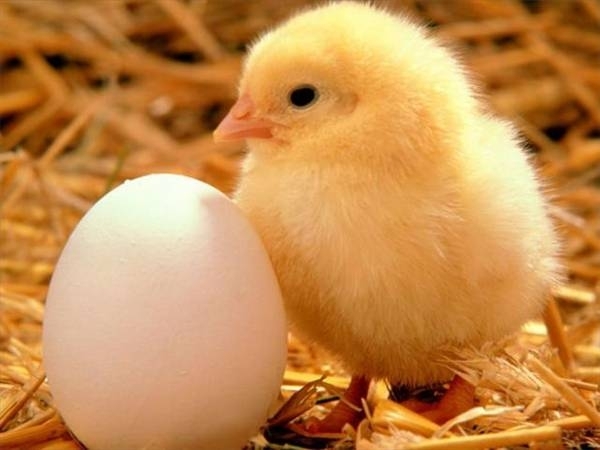 Chicken oocytes are packaged with the yolk and are contained together inside a thin membrane made of protein. These packages are released one at a time into the oviduct, the tubular "assembly line" leading from the ovary to the outside. The oocyte will linger in the beginning of the oviduct for about 20 minutes waiting for fertilization. If no sperm are present, the egg will proceed down the line. In the final journey down the line, the egg white will be added. The shell membranes are next and are followed by the construction of the shell. Albuman - This is commonly known as the white of the egg. Chalazae - This keeps the yolk in place. Egg Cell - This part would develop into a baby chick if it were to be fertilized. Yolk - The yolk is full of goodness and feeds the chick if the egg was fertilized. Shell - Protects the inside from germs. 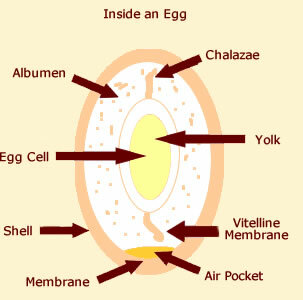 Vitelline Membrane - This holds the yolk together. Membrane - This is a fine skin that surrounds the egg. Air Pocket - The air pocket grows as water is released. The smaller the air pocket, the fresher the egg. So what is it about the egg, that has some people swearing that it is the devil's spawn? Well, according to some health experts, one egg contains over six grams of protein and several important nutrients, which is good. Unfortunately, one egg also contains about 212 mg of cholesterol. Since the recommendation for cholesterol consumption is about 300 mg per day, the large amount of cholesterol in eggs may prevent many people from eating them. The cholesterol in eggs really shouldn't scare you away completely. Most of the cholesterol in your body is made by your liver and the amount of cholesterol in your diet may not have as big an impact on your blood cholesterol as people once thought. In fact, you can eat one egg every day without harming your cholesterol and other blood-fat levels. That's really good news because eggs are very satisfying. Eating one egg as part of a healthy breakfast may help you lose weight by keeping you from getting hungry later in the morning. So enjoy that powerhouse egg. And if your worried about sitting down to a two egg breakfast, then maybe consider making a special treat like crepes, or my favorite...crème brûlée! For the hen, she's just doing what she was meant to do. 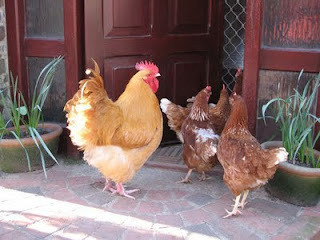 For us, her egg laying has been the staple for hundreds of years in most kitchens and bakeries around the globe. And unless you down a dozen eggs a day, then be reasonable, and if you need to watch your intake of cholesterol then take the eggs and skip the bacon! Preheat oven to 300ºF. In a large bowl, whisk together egg yolks and sugar until the sugar has dissolved and the mixture is thick and pale yellow. Add cream and vanilla, and continue to whisk until well blended. Strain into a large bowl, skimming off any foam or bubbles. Divide mixture among 6 ramekins or custard cups. Place ramekins in a water bath (large pan filled with 1 or 2 inches of hot water) and bake until set around the edges, but still loose in the center, about 50 to 60 minutes. Remove from oven and leave in the water bath until cooled. Remove cups from water bath and chill for at least 2 hours, or up to 2 days. When ready to serve, sprinkle about 2 teaspoons of sugar over each custard. For best results, use a small, hand-held torch to melt sugar. If you don't have a torch, place under the broiler until sugar melts. Re-chill custards for a few minutes before serving.